Nicki Minaj performs onstage at the 2018 BET Awards on June 24, 2018 in Los Angeles. The rapper's latest album Queen arrives today. Nicki Minaj fans have made it through the storm for their matriarch. The Queens rapper releases her fourth studio album Queen. 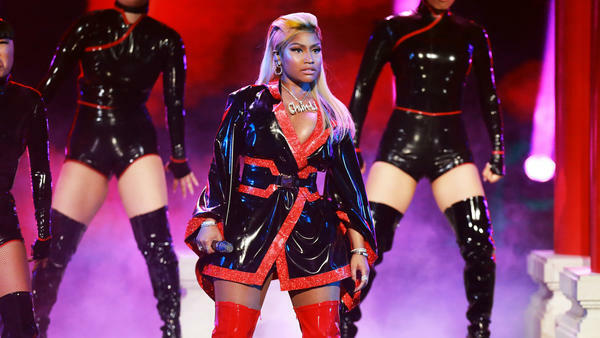 The platinum-selling rap star launched her Queen Beats 1 radio show on Apple Music last night, where she not only announced the updated release date for Queen but also previewed tracks from the LP. Now, the album is available on Apple Music. Fraught with teetering shade, Internet trolling, a flip-flopping release date and awkwardly-timed collaborations, the lead-up to this album has been, let's be honest, a shambles — and has subsequently genuinely baffled rap fans. Regardless, Queen is here. With features from Foxy Brown, Lil Wayne, Ariana Grande, Eminem, The Weeknd and more, Minaj has assumed her most recent alter-ego of latex-ninja Chun-Li — yes, the same persona that has been cited as an exemplar of cultural appropriation — and recaps the last four years over its 19 tracks.